This volume is the first to bring together music scholars working on Baltic topics from throughout Europe, North America, and the Middle East for the purpose of exploring the impact of Nazi and Soviet occupation (1940-91) and the restoration of republican independence upon the production of musicological knowledge in and about the Baltic States of Lithuania, Latvia, and Estonia. Its collected essays sketch, for the first time, post-Soviet histories of the sociological dimensions of music study in the region, and examine methodological and ethical problems raised by music scholarship. They shed new light on such topics as the advent of Lithuanian musical modernism, the ecumenicity of Christian musics in Estonia, and the effects of Soviet nationalities policy upon the Latvian musicological discourse. 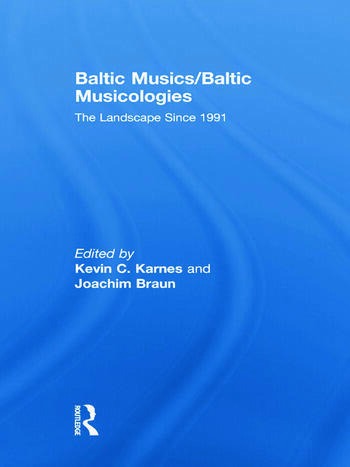 Together, they confront those aspects of Baltic music study that still bear the marks of the Nazi and Soviet experience, and they suggest ways in which the turbulent cultural and political histories of the region might be negotiated by scholars presently active in the field. Kevin C. Karnes is Assistant Professor of Music History at Emory University (USA). He is the author of Music, Criticism, and the Challenge of History (Oxford University Press, 2008), and co-editor of the revised and expanded edition of Brahms and His World (Princeton University Press, 2009). Joachim Braun is Professor (Emeritus) of Music at Bar-Ilan University (Israel). He is the author of On Jewish Music (Peter Lang 2006), Music in Ancient Israel/Palestine (Walter B. Eerdmans, 2002), and Studies: Music in Latvia (Musica Baltica, 2002).